You can add a teaspoon of dried chilli flakes to the pasta if you like it nice and hot. I also love mixing it with sautéd tuna cubes. 1. Break the cherry tomatoes into small pieces, squeezing out the seeds, and put into a bowl. Finely chop the garlic with the parsley and add to the tomatoes. Season with the chilli and pepper, pour in 3 tablespoons of olive oil and stir to combine. Set aside for 30 minutes to let the flavours develop. 2. 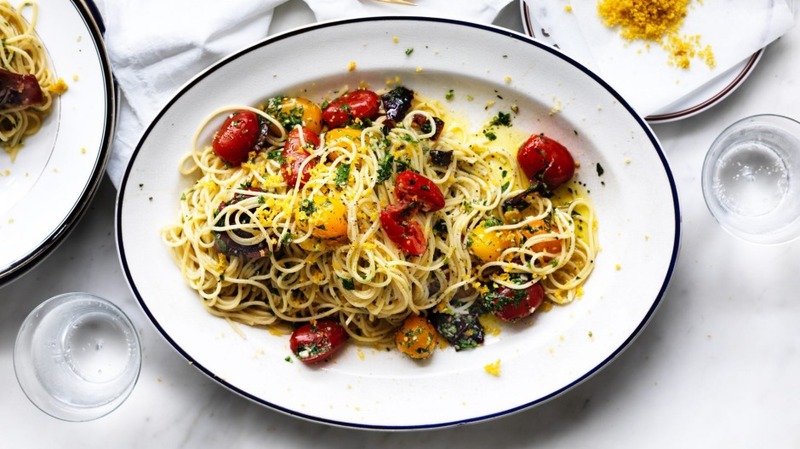 Meanwhile, in a separate bowl, grate the bottarga using a microplane or the finest side of a cheese grater, reserving a little to grate over the finished dish. 3. Bring a large pan of salted water to the boil, add the spaghetti, and while the pasta is cooking, warm the tomatoes in a separate pan. When the spaghetti is al dente, drain it and return it to its saucepan, reserving a little of the cooking water. 4. Add the bottarga and 2 tablespoons of olive oil and toss, making sure to coat each strand, then stir in the tomatoes. If the sauce is too thick, add a further drizzle of olive oil and a little of the reserved cooking water. 5. Check for seasoning and serve with a little extra bottarga freshly grated over each plate.